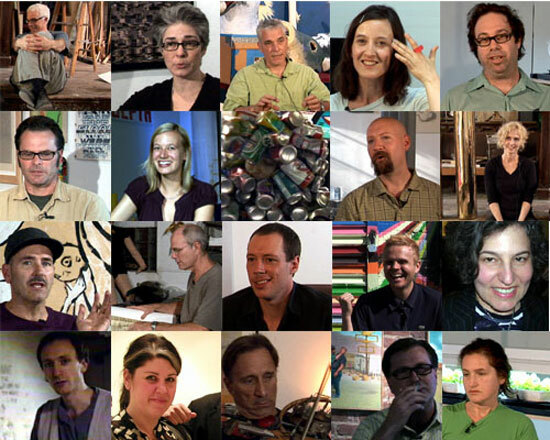 I got a bunch of emails about a documentary film on the Williamsburg art scene. I thought it would be interesting and I knew everyone from the neighborhood would be there, so, I let it sit in my email in box. I wasn’t completely sure about whether I should go or not. I didn’t even know this film was being made. I’ve been in Williamsburg for ages, but then again, I spend a lot of time in my studio. Then I got an email from my old pal Erika Knerr (who by the way was the person who first took me to Four Walls back in …….hmmmm…let’s say 1990 or 91? Could that be right? Yikes.) Erika emailed and said she was coming to town to go to the premier and wanted to know if I wanted to go with her. Having a pal to cavort with always makes me more into things, so I said yes. Internally I was still a little reserved about going. If I wasn’t in it and I didn’t even know that it was being made I just figured all the cool popular kids would be there and I would be just watching all the fun everyone else had while I was in my studio painting (kind of like now). Long story short, Erika couldn’t make it and I went with a new filmmaker friend who is about as far away from the Williamsburg art scene as my new teaching job at Bergen Community College, in Paramus NJ. Gregg Biermann is way cool and he’s a filmmaker so, I thought he could help me be objective when I inevitably would get caught up in recognizing people and places or remembering if I was at some opening or party. Marcin Ramocki introduced his film, Brooklyn DIY, at the Museum of Modern Art. He had that self-effacing, open quality that Williamsburg artists had and obviously still have so, I was ready to go down memory lane. Whether I was watching old footage of Test Site mega-parties or succinct, provocative interviews with artists like Ebon Fisher and Ward Shelley, I was glued. 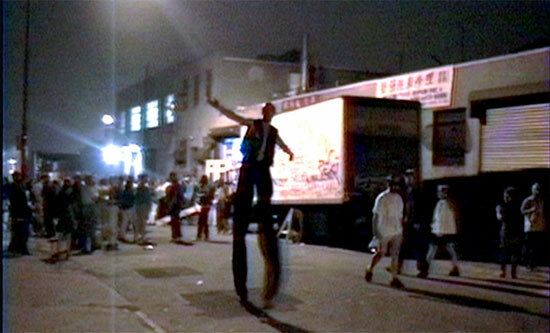 The film had an incredibly tough challenge: approximately fifteen years, artists, art making, art in every style and medium possible, community, gentrification, freedom, change, artist run venues, renegades, real estate, documentation and lack of documentation, memory and it’s fallibility, the list of obstacles to creating an accurate film about this subject seemed insurmountable. And here’s the topper – how to make this film an artwork – a living thing that is about the present integrated with the past. With all the obstacles Ramocki faced he also had the best resources any filmmaker could ask for, a bunch of artists. Matt Freedman opened the film with a performance of drawing the history of Williamsburg before the artists came on a white board while Tim Spelios played a drum. Mike Ballou did the majority of his interview wearing a paper maché bear head. (Ken Burns would pay cash money for that.) Amy Sillman was insightful and didn’t mince words while petting her dog. 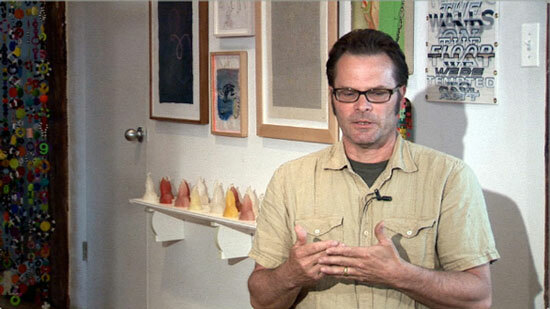 Joe Amhrein, who always seems at ease because of his sincerity and dedication to art. Wild loft party footage. Aron Namenwirth and Nancy Horowitz sitting beside an art installation of Zoe Sheehan Saldaña’s plants growing under fluorescent lights. And I save him for last so you can bow your heads when I invoke the name, “Gene Pool”. Afterward, my present tense colleague, Gregg liked it. I was in a fog. I really wasn’t sure what I thought about the film objectively as a documentary. The audience was packed with Williamsburg artists. All of the well-known characters were there, only a few were missing, the critics and writers attended, and of course the Williamsburg artists were there in true form; Williamsburg doesn’t dress up even for MOMA, and they always look great. Part of my fog was nostalgia and part was that the film was stirring up feelings of being inspired. That time was inspiring. The participants were inspired. Clearly Marcin Ramocki was inspired and submerged himself in the material for two years and sunk his retirement account into it, but that’s nothing any artist wouldn’t do, right? When it was over I didn’t go to the after party. I guessed that the conversation mixed with beer could go a number of ways, of course a lot of praise for Marcin’s hard work and dedication, which he deserved, and opinions on the quality of the film? Would arm wrestling ensue? Would this be Jackson Pollock and Barnett Newman at the White Horse? If any crowd could do that this one could. Other responses would obviously be about accuracy or treatment of different aspects of the scene. I went home and emailed Marcin asking for an interview. 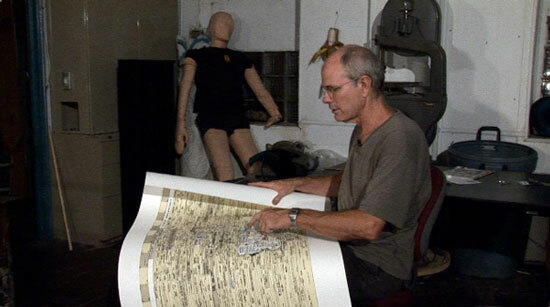 Ward Shelley showing a “timeline” of the history of the Williamsburg art scene. We made arrangements to meet at Fanny’s restaurant on Graham Avenue. When Marcin politely tried to give me directions my Williamsburg attitude popped up as I quickly told him that I’ve lived here forever and I knew the way. Did I mention that Williamsburg artists wear time spent in the trenches like Purple Hearts? piracies as having a relationship to the way he parses information into art. The interviews that framed the historical footage in the film; Ebon Fisher, Amy Sillman, Mike Ballou, Joe Amhrein, Ward Shelly, Jude Talllichet, Matt Freeman, Ken Butler, etc., were wonderful. 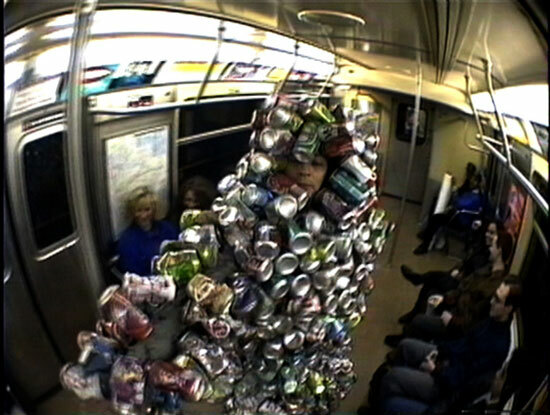 As Ramocki said at the premier, Williamsburg artists aren’t shy. 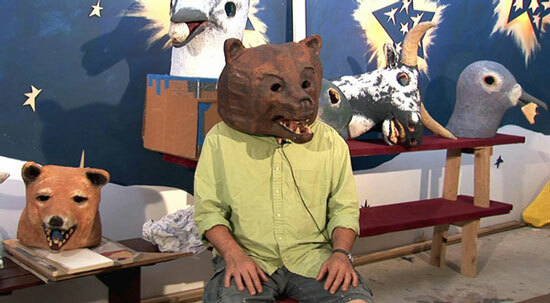 Ramocki said that the interviews that became performances such as Mike Ballou talking with a bear head on and Ken Butler demonstrating his instruments occurred naturally. The stories of filming the interviews were charming and the ones that got away were good to know about. One story Ramocki recounted about an interview he would’ve liked in the film was the guy who owns De Vito Paints on Graham Ave. “Originally his customers were people from the Italian community who painted their houses for communion celebrations, then there was a period when no one bought paint. When the artists came it was the gallerists coming in to buy paint for their walls. He told the story of this area though sales of house paint! And I thought ‘wow this could be the bridge between the community that was here before, to the new community of artists’, but he said he wouldn’t do it. I think he just didn’t like being on camera.” Some other people were just camera shy so, some of them ended up being narrators. Eric Heist, of Momenta, who doesn’t appear in the film was absent because of scheduling problems. Ramocki also talked about additional footage of Joe Amrhein discussing Mark Lombardi’s work, that didn’t make the final cut because it felt like a separate subject and became overly dramatic due to Lombardi’s suicide. Ramocki was very aware of the vastness of his subject and the challenge of “representing the different ‘tribes‘ of Williamsburg” and he acknowledged that he had his own proclivities because of affiliation with his ’tribe’. All photos are stills from “Brooklyn DIY”. On Saturday February 7th, 2009, a small group from the Arts Council of Princeton set off with me to New York City to explore green art and design. Picture us all driving in an ordinary, smog-producing van from New Jersey through a tunnel and emerging into an imaginary world, the green city, a model of sustainable living, with organic gardens growing up the sides of friendly buildings and clean streets filled with cheerful, creative citizens. This week Steven Chu, Secretary of Energy, Nobel-Prize Winner, physicist, was interviewed in the New York Times and let it be known from the top down that we need a revolution in science and technology. We need replacements for fossil fuels and new ways to curb CO 2 emissions. Solar needs a serious upgrade. Alternative fuels and clean ways to burn coal need to be invented PRONTO. We knew this, but now you know it too. Calling all engineers, P.H.D’s, politicians and investors: start small, start big, be brilliant, talk amongst yourselves, make it happen, and then lay it on us. We’ll take one in every color. We, the consumers. What exactly are our obligations towards being sustainable, when we don’t have enough green to invest in green updates, and to buy those green treats? What’s happening to the dream when everything is tasting so stale right about now? The environment has been on my mind for about 20 years now. For quite a while I have been making my own art out of broken umbrellas, the mail, magazines and other abject ingredients, including most recently, paper coffee cups. 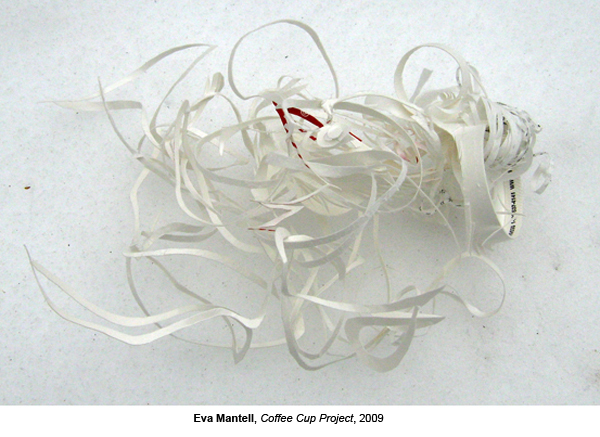 Seeing that those paper cups we throw away are in effect a group environmental sculpture anyway, on view at your local landfill. I thought I’d see what I could do with this vessel, this little disposable grail that has known the human touch and taste of human lips. I took a few photos of some pieces in the snow that fell last week, putting the coffee cups back on the ground where they were headed anyway. Finding what is human in these things, finding something new to do with them, is now eagerly called “recycling in art,” which my literal mind says ought to be taking old paintings or sculptures and grinding them up into new ones, or something like that (not a bad idea!). My own use of the stuff around me presents a situation where a particular material is being asked to behave in a way that argues against its original utility. It’s not literal recycling, but a lament for our relationship to the environment. But it’s fair to say you can recycle in jewelry, as mining new metals actually pollutes a great deal, and you can literally melt down old pieces to make new ones. Meet Lisa Linhardt, a young jewelry designer in the East Village, whose entire M.O. embodies environmental and socially conscious principles. From her artful, salvaged display cases to her reuse of metals from existing pieces to her support of education and the arts in the developing world, she really embodies a new approach. 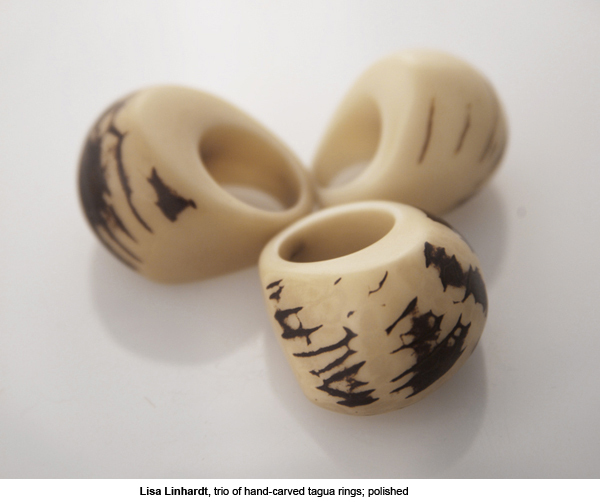 The jewelry is cool and lovely and the old anthropologist in me practically had a cow when I saw her carving tagua nuts into rings. These nuts apparently drop from trees in the rain forests of Ecuador and are an eco-friendly substitute for ivory. I might have to get some myself and check back with you soon. At the studio of I-Beam Design in Chelsea, Suzan Wines is in the middle of preparing for her class at Cooper Union on the design of the city when we arrive. The city of the future is not the beautiful emerald vision of my dreams, but an unsafe, unsanitary chaos with populations surging and infrastructures overburdened or non-existent. Megacities in shambles. She and her partner Azin Valy created a prize-winning design for refugee housing using the simple idea of fitting wooden shipping pallets together to create temporary shelters that can be plastic sheeted, insulated with local materials, stuccoed, and gradually expanded as needed. The idea is so simple, so practical, so confident, so humane, as medical supplies and food will be delivered on pallets, so the materials will be right there. But to Wines the idea isn’t enough. 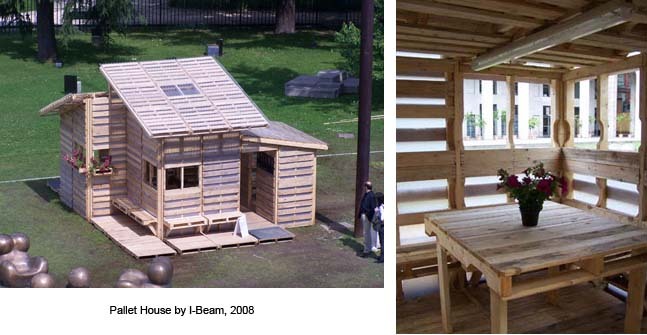 The pallet house has been built as a model, but has yet to house or help a population of refugees anywhere in the world. Ideas can begin to seem like a luxury. 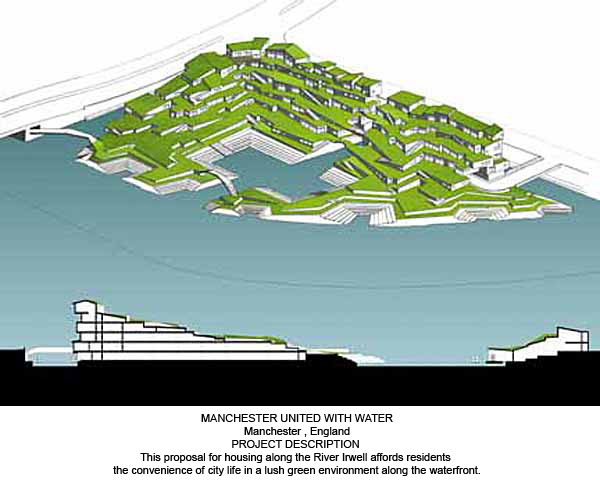 But what ideas: we get to see many designs of cool urban renovations that have been built and an as yet only imaginary green city complex in Manchester, England, with canals and canal boats that clip right onto the apartments, like floating elevators. Oh, to float my boat. Onto Black and White Gallery in the Terminal Building in Chelsea on 11th Ave and 28th St., we meet up with three artists using clothing in their work: it’s hands-on work with material which seems so manageable, so personal and so private after our discussions of architecture within such a complicated context. Orly Cogan traces sketches of femininity in thread, making stops to embroider some mythic moments, Adam Niklewicz crafts Freudian situations from memory and dreams, and Tamara Kostianovsky creates exposed, animal flesh from girlish clothes. The body is still a funny, mythic and ultimately tragic place. 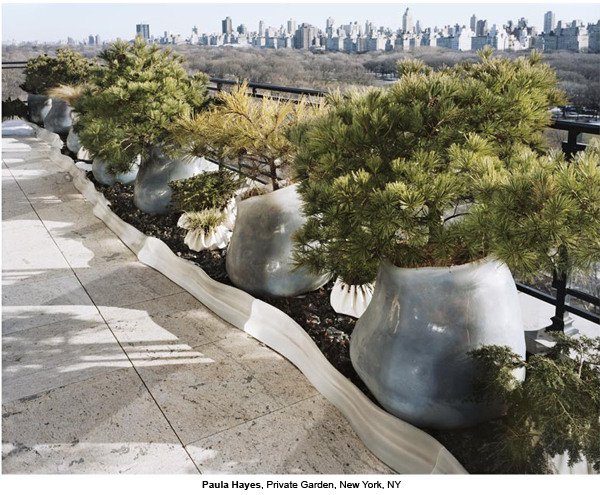 Our last stop is Paula Hayes, a sculptor, thinker and landscape artist whose soft forms containing plants sit on urban rooftops, balconies and in the wilder contexts of suburban landscape. It’s a soft world in here as one translucent bulbous element after another peeks out at us. 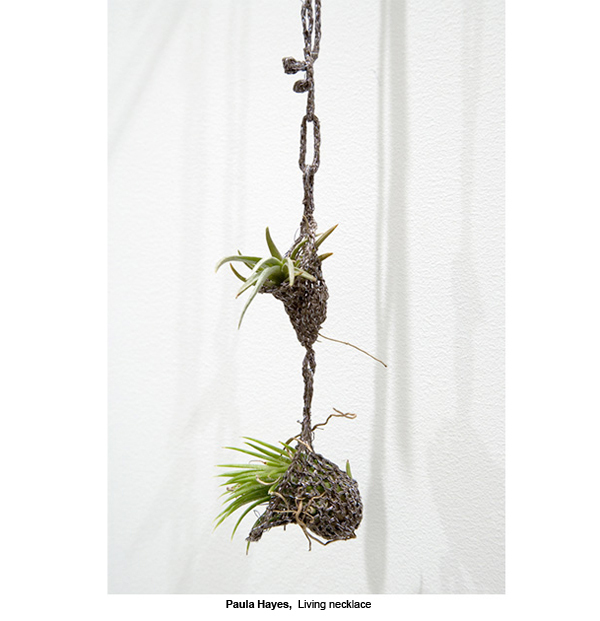 As she speaks about her art she gently puts on a living necklace, an epiphyte plant that would originally nestle in the crook of a tropical tree. The boundaries are getting soft again, as she seems to me to change herself into a kind of tree, supporting another species on her skin. Her artworks are messages in bottles she is sending into the future. Tend, nurture, protect, spray with mist, repeat.